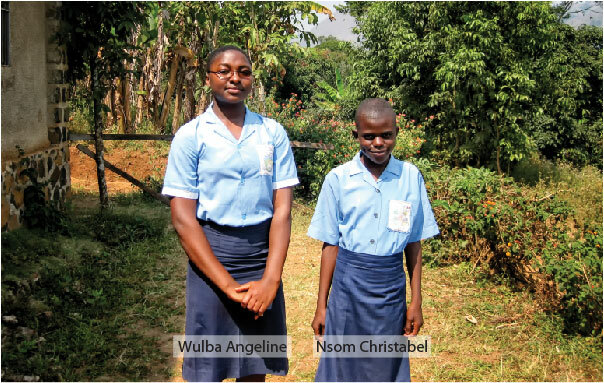 In 2011, A2Empowerment provided scholarships to 57 students, in the Adamaoua, North West, and North regions of Cameroon. The following profiles were written by a few of the scholarship recipients or communicated by their Peace Corps Volunteer (PCV) mentor. The statements below were written by the scholarship recipients and translated by Ms. DeRocco. Blandine Nbjoubara: "My name is Blandine Nbjoubara. I'm 16 years old and I'm the primaire class at the Belel High School. I come from the village of Bakari-Bata which is about 32 kilometers away from Belel. I would like to thank the women who decided to help us last year. I received a scholarship in which allowed me to afford the school inscription fees. This scholarship encourages me immensely in my studies. The scholarship is a marvelous and amazing opportunity for us in our academic journey. The advice I would give to young girls is to attend school and have good grades. Thank you, Blandine." Oumoul Koulsoumi: "My name is Oumoul Koulsoumi. I am a student at Belel High School in the toisieme. I come from Wassande, a small village about a 1hour 30 minute moto ride from Belel. The scholarship has helped me with school inscritption fees and other necessary school items. When I obtain my Baccalauriat, I hope to become a doctor." Mardjane Asta-Djoumba: "My name is Mardjane Asta-Djoumba. I am a student in the toisieme at Belel High School. I was born on December 17, 1993. My village, which is a 45 minute moto ride from Belel, is Beka-Modibo. The subjects I like in school are History, Geography, and French. After I finish my studies I would like to become a doctor and above all a respectable woman. I would like to thank all of those who have helped me with the greatest sincerity for the opportunity to have a scholarship. " Rassidatou: "My name is Rassidatou and I am a student at Belel High School. I am in the German track. I received the A2Empowerment scholarship this past year. I wanted to thank you for giving me the opportunity. The scholarship has enouraged me to attend school this year. Now, I find education is important for young girls. "Thank you for encouraging our young girls to attend school. When I have a dimploma I want to search for a good job, however, I think of hoping to become a doctor." "Njei Emmerencia is 28 years old. She dropped out of school when she had her first child at 14. She now has four children. Her father had two wives and fifteen children between them. Emmerecia's husband is a tapper (he collects palm wine from the Raffia Palm) and ears about 30,000 cfa a month (about sixty dollars). Emmerencia's husband does not assist in supporting her with her school tuition and supplies. Emmerencia wants to be a Journalist. "Sepu Snaida has lived with her grandmother for the last seven years. Her mother died when she was young and her father lives in the Southwest Region. Her father is currently harvesting timber in the densely forested region where they are conducting mass timber exploitation. He rarely returns to the North West Region. Snaida has two sisters and one brother but her father does not have enough money to support all of the children. Snaida is sixteen and hopes to be a nurse. "Tebong Carine is fifteen years old and lives with her grandparents. Her father died when she was very young leaving her mother to look after her and her one older brother. Her mother lives in Batibo (the nearest large village) and is working as a PTA teacher at the primary school. Primary school PTA teachers earn about 20,000 cfa a month (compared to 100,000 to 170,000 of government teachers.) Carine's grandfather worked for a prison all his life and is now retired. He helps at Government Secondary School Kurubei as a Discipline Master to earn extra money. Carine's mother hopes to marry again, but it is difficult for women to marry a second time in Cameroon. It is normal in this area for women to be taken as "girlfriends" to men who already are married. Carine hopes to be a nurse. She is one of the few girls in GSS Kurubei who has chosen a specialty in Science." 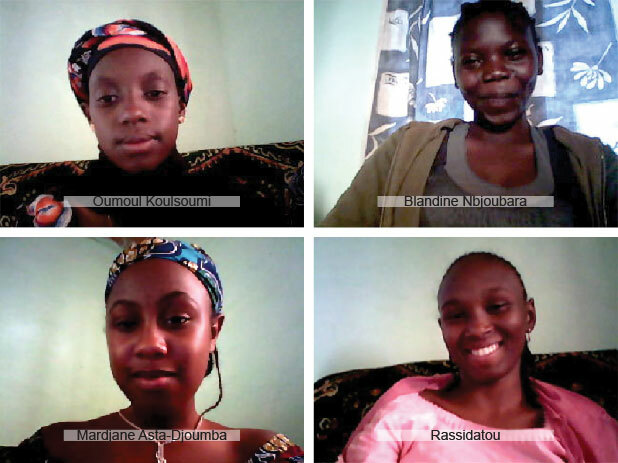 "Halimatou is a shy, yet incredibly talented young woman studying in 2eme this year. She comes from Tourningal, a small, rural village in the Adamaoua province of Cameroon and she is one of the first girls to leave Tourningal to continue lycee (high school) in the regional capital. Halimatou is deeply interested in science and loves to laugh. It is only through the support of the A2Empowerment Scholarship that Halimatou has been able to continue school and her family is grateful for the assistance so they can support their daughter's education. "Mariamou is an unique young woman. She also comes from Tourningal, a very small, traditional, Muslim community, where it is still commonplace for girls to leave school as young as 12 to get married. Mariamou is not only intelligent, but outspoken and eloquent. In Tourningal, she was president of the English Club and even though she has had to change schools this year to continue lycee (high school), she continues to get some the highest scores in English in her class. Mariamou wants to become a journalist in the future. She is not only a stand-out student, but she is the leader among the scholarship girls from Tourningal and has coordinate their community contributions, including peer tutoring. "Rafeatou is a gregarious, funny, and outgoing young woman. She comes from a family of 12 children and the academic success of her older brother, who has become a teacher, has made her family more supportive of education. Rafeatou is a hard-working student, who enjoys studying English and science. She is very involved with her fellow students and participates in a number of clubs." "Miss Mirien is in Form IV at GHS Ewoh. She comes from Small Ekombe, a village in the Southwest Region of Cameroon. She is the youngest of the family's five girls. When her older sister married an Ewoh man, she followed them there. In addition to her studies she farms and cooks for the family. She wants to be a medical doctor." Ms. Polzien was able to send us a letter of appreciation from Munoh Ruth Azoh. A2Empowerment is proud to present a few of the scholarship recipients who continue to receive support. Ms. Jehle sent the notes to us, and they were translated by Returned Peace Corps Volunteer Claire Hutchinson. 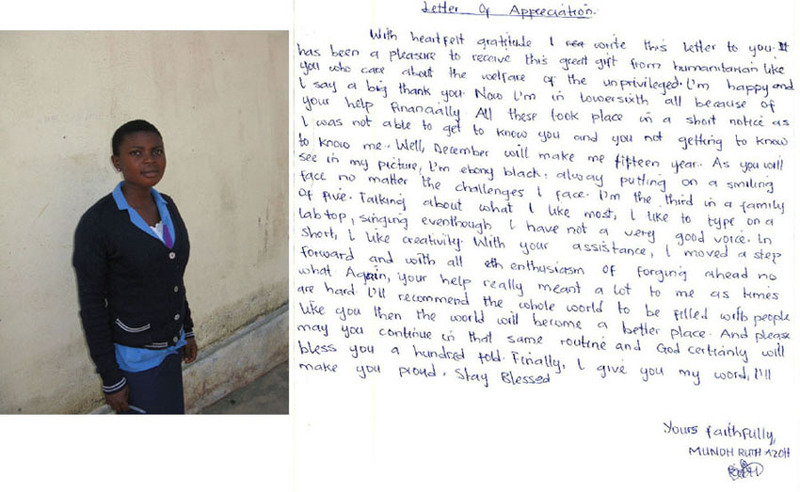 Africa writes, "Thank you so much for your help and I am thrilled to say thank you to you. Thank you." Catherine writes, "I just wanted to tell you that I am so proud of the help you've given me this year, because it has allowed me to go to school and I have been able to continue with my education. All that I would like to say to you is thank you and also thank you to all of your other members." Genevieve writes, "This is just to thank you for the two scholarships you've given me, this year and last. Thank you infinitely for everything you've given me. Without these scholarships, I would not be in school this year." Houma Marthe writes, "All I really want to say is hi and thank you for all that you have done for me during the years that I was most vulnerable. I will never stop thanking you for these scholarships that you have helped me with these last years." Ndowen writes, "This is simply to thank you for the support you've given us. We want to offer you our deepest gratitude and we will be with you til the very end." "It is with immense joy that I pick up my pen to express my heart felt gratitude for your kind gesture. "For the second time, I have been a beneficiary to your scholarship for girls in my community. As such, not only have my school fees been paid promptly, the affording of other necessities like school bag, textbooks, uniform and others, have been purchased with the balance. With all these at hand, my lower sixth studies were a smooth ride and I believe this year will be an even better one as I look forward to making it excellently in my end of course exams come June 2012. I also believe strongly that, only my passing the G.C.E. that can truly express my appreciation. Hard work is one of the aspirations that will be motivated in other students, thanks to your extended arm of goodwill. But this does not in any way stop me from working even harder when I eventually get to the university for thanks to organizations like yours; I have clearly seen that a woman?s place should no longer be relegated to the background. "Madame, it is at this juncture that I wish to put a cap on these few words, hoping for God's continuous guidance and blessings on your effort. Thank you once again. "It is with immense gratitude that I write to thank you on the basis of the scholarship that was awarded me for the 2011/2012 academic year. This scholarship has contributed tremendously in my studies and I've witnessed a great improvement in my performance; that is with the aid of the textbooks I acquired and the payment of my fees on time, my results this year will definitely be better than ever before. "I am therefore, Madame, very thankful to you for the wonderful support and I will be very glad if such gestures continue.